Luton boss Nathan Jones doesn’t care how his side reach their target of promotion this season, just as long as they do it. The Hatters’ made it three wins from four on Saturday by beating Exeter City 1-0 at Kenilworth Road, with all three victories coming by just the single goal. It would be lovely to win by more, but however we get three points, we’ve just got to get them. 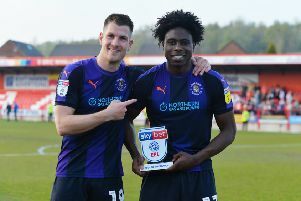 Although Town were hitting sevens and eights earlier in the season, plus putting five past Swindon and four past the Grecians, Jones knows that these triumphs are just as important. He said: “They totally are and Exeter a few weeks ago went to Notts County and won 2-1, playing exactly the same way, 4-1-4-1. “Then they changed to 4-4-1-1 late on, so it shows we’re a good side. I don’t care how we win, I really don’t, however many wins we need, if it’s nine, 10, or whatever, I’ll take them all 1-0, I really will. Luton had plenty of opportunities to score before Harry Cornick notched the only goal of the game on 38 minutes, while they also created a number of openings in the second period, with their final ball lacking at times. Jones continued: “If we’d had a little bit more composure in the final third then it would have been (more), because Jake Jervis snatched at two, Jack Stacey snatched at one and we’ve had so much play in and around. “We just need to find that little pass or that shot and I thought we were excellent attacking-wise. “Our build up play was wonderful, we moved the ball well, and I thought we were excellent going forward, I really did. “We deservedly got the goal, yes it was slightly fortuitous, but we had far more opportunities. “Second half, we had opportunities with great situations, great positions, again, a little bit more guile and we would have done it. “It would have been very, very harsh, I wouldn’t quite say a travesty, if they had nicked a goal at the end, but we limited them to very little.